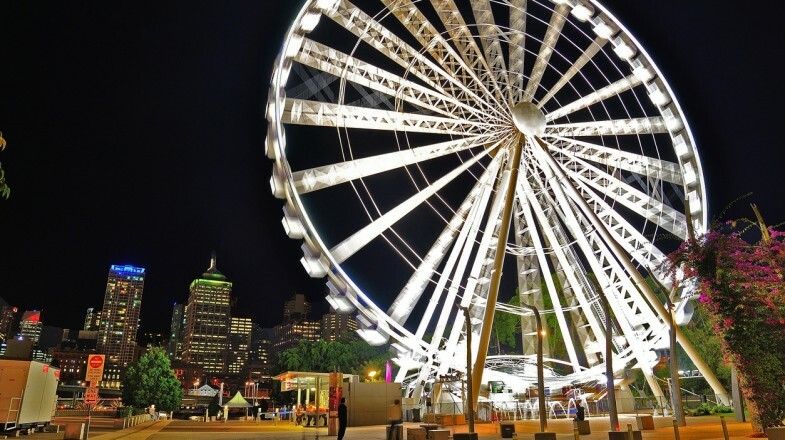 The Wheel of Brisbane is an iconic structure from where you can get a 360-degree view of the city. 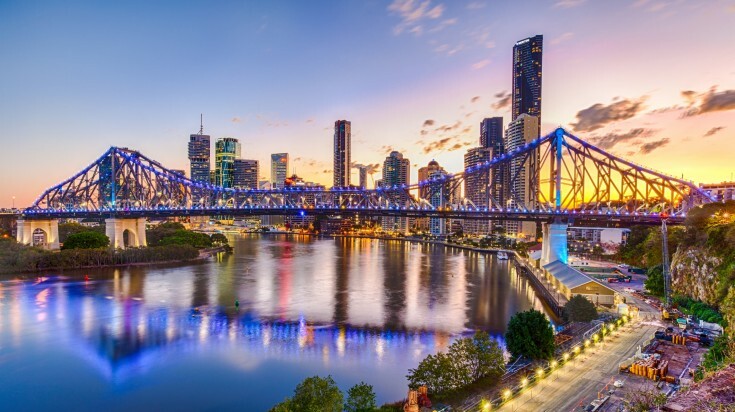 Brisbane — Queensland's capital prides itself on balancing its cosmopolitan polish with a laid-back tropical lifestyle and gloriously sunny weather. With its signature Brisbane River and nearby Moreton Bay, Brisbane has water fun on tap, while its CBD plays host to fabulous retail therapy, sumptuous restaurants, and a vibrant market. Climb the iconic Story Bridge, cuddle a Koala, and go for a river cruise or picnic in a park. Confidently Australian, there are plenty of things to do in Brisbane. The Brisbane CBD offers something for everyone. Stroll around its streets to discover delightful heritage and architecture, including the Customs House, Treasury Building, enticing boutiques, and delightful food options. King George Square is another highlight to visit that has events, festivals, and markets happening regularly. Insider’s tip: Don’t miss a 45-minute guided tour of the gorgeous 1930 Brisbane City Hall. Just a short walk across the Kurilpa or Victoria Bridge is Brisbane’s Cultural Precinct, one of the top things to do in Brisbane. Its QAGOMA art gallery is home to modern Australian and Asian art. Beside GOMA is the State Library of Queensland, the Queensland Museum and Sciencentre and even a bodhi tree descended from the Buddha’s tree. Opening hours: Daily QAGOMA 10:00 am to 5:00 pm, Queensland Museum 9:30 am – 5:00 pm. Insider’s tip: The GOMA Restaurant's menu is as creative as the art! 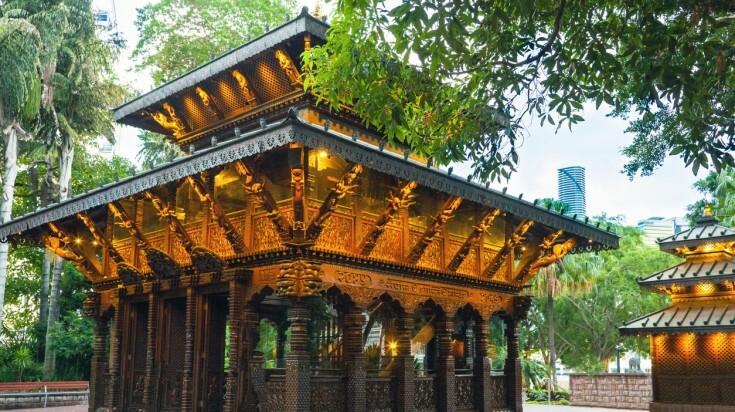 Visit the Nepal Peace Pagoda in the South Bank Parklands. The South Bank Parklands is Brisbane at its best. Beautiful parkland, a delightful riverfront promenade, an artificial beach, and sumptuous restaurants mix with trendy cafes. Unwind, chill out, you can even meditate at the Nepal Peace Pagoda. There’s even free Wi-Fi! Insider’s tip: Check out nearby Little Stanley Street, it’s one of Brisbane’s best dining locations. Climb the iconic Story Bridge and get the best view of Brisbane. Brisbane’s iconic heritage-listed Story Bridge connects Kangaroo Point to Fortitude Valley over the Brisbane River. A 2.5-hour Story Bridge climb provides enthralling views overlooking the Brisbane skyline, Moreton Bay and the Glass House Mountains. Opening hours: 7 days a week, hours vary with climb options. Entrance fees: Climb and dine USD 98, Day climb USD91, Express climb USD 84, Twilight climb USD 113, Night climb USD 98, Climb and abseil USD 112*. Insider’s tip: Opt for a Twilight Climb to watch the city come to life with lights. If you are wondering what to do in Brisbane, board a CityHopper ferry and watch Brisbane’s sights glide quietly past. 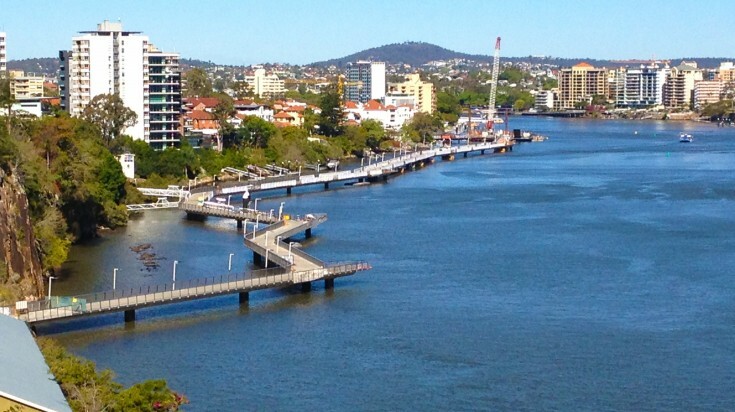 This is the ultimate stress-free way to see the city and get to know the Brisbane River. Opening hours: The CityHopper ferry service visits 6 terminals every half an hour, seven days a week between 6:00 am and midnight. Entrance fees: The CityHopper is free. Insider’s tip: Make the most of the CityHopper’s hop on and hop off model to explore different parts of Brisbane’s riverfront. Brisbane’s Maritime Museum features a fascinating collection of exhibits showcasing Australia’s maritime history. Check out the museum’s historic vessel collection, including the world’s last River Class WW2 frigate the Diamantina and a dry dock dating to 1881. Entrance fees: Adult USD 11, Children USD 5, Family USD 27, Seniors USD 10*. Insider’s tip: Stay strictly nautical by catching a ferry to the museum. The Riverwalk zigzags its way from New Farm to Howard St. Wharves. 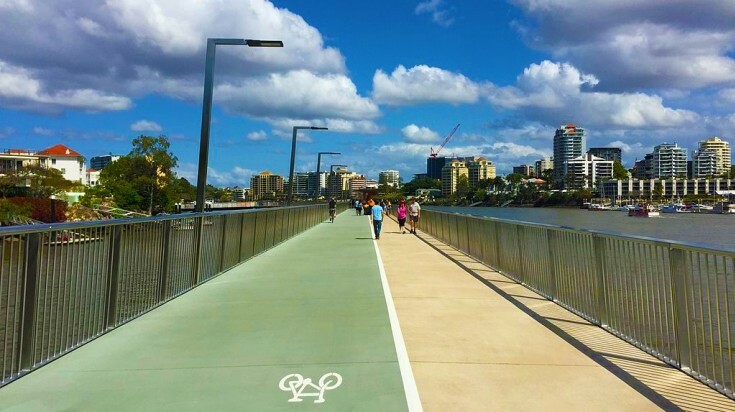 The Riverwalk is a highway for pedestrians and cyclists jutting out along the most scenic tract of Brisbane river. Cycle or saunter the New Farm Riverwalk. 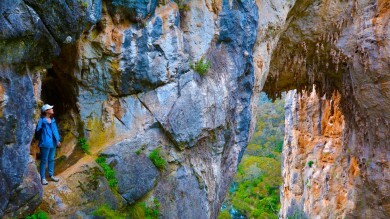 This is a Brisbane “must do”. Set across from the eastern bank of Kangaroo Point, the new Riverwalk zigzags its way from New Farm to the Howard St. Wharves and on to the Brisbane CBD. Dedicated roadways have been separated for cyclists and pedestrians. Insider’s tip: The best time to visit is during summer months from December to March but there is no shade to escape the harsh Australian sun so visit either early in the morning or at dusk. If Australian native trees and tranquility is your thing, the Sherwood Arboretum is for you. With a collection of 1,000+ specimen trees, some rare and endangered, the heritage-listed arboretum is the perfect place to learn about Australian native plants. 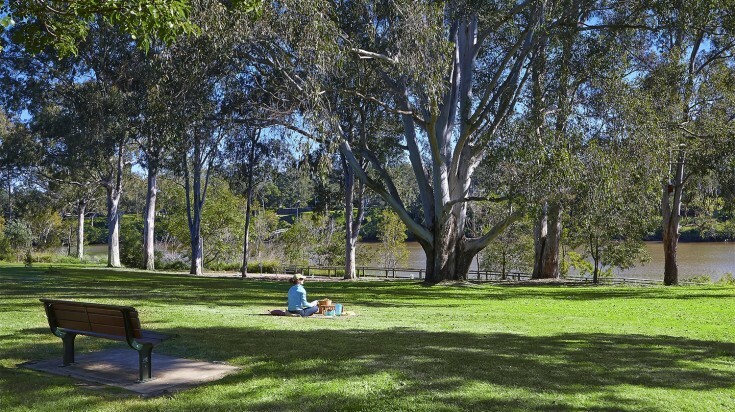 Discover your zen by exploring the magnificent trees on the Tree or Heritage trails, photograph the wildlife living in the trees on the Bird Trail, sizzle a sausage or go for a jog. Insider’s tip: There is no lighting in the Arboretum so visit during daylight hours. Get a chance to come up close to a koala and even carry one in your arms. 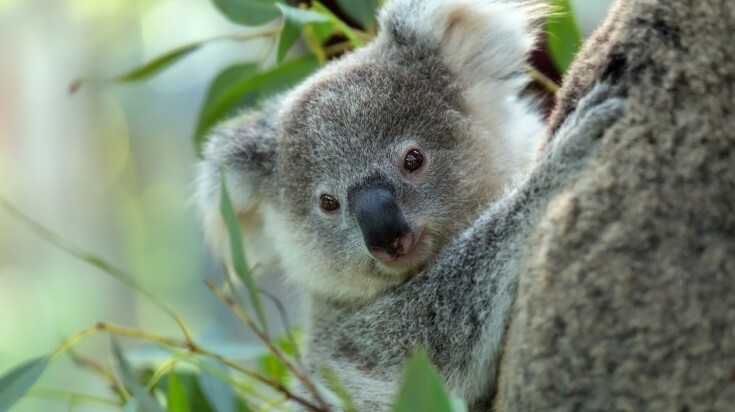 The world’s first Koala sanctuary, today Lone Pine has more than 130 koalas. The sanctuary allows you to cuddle a koala making for magical memories. You can also hand-feed kangaroos, hold a snake and see native birds and animals in natural settings. Insider’s tip: Plan your visit to witness the daily free flight Raptor show at 12:30 pm, it’s amazing! Steam Train Sunday in Brisbane is your chance to ride a legendary historic steam train through Brisbane. The train departs from and returns to Roma Street station. Inside its carriages, you’ll discover a bygone era of elegant rail travel. Opening hours: Departs 10:15 am and 11:40 am on the first Sunday of each month. Insider’s tip: Wear sunglasses to protect the eyes from the cinders that the steam engine throws off. Humpback whales can be spotted off the coast of Brisbane from June to November. Moreton Bay is the place to be in Brisbane for watching Humpbacks and Southern Right whales. 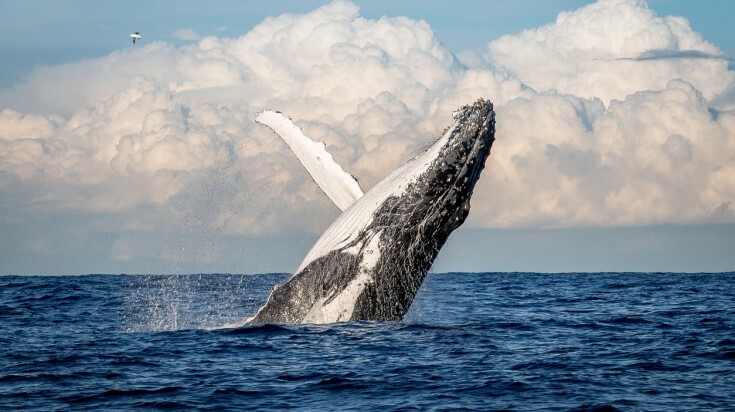 During the whale-watching season from June to November, these gentle giants of the ocean frolic in Queensland’s warm waters as they rest from their annual migration and nurse their young. Opening hours: Departing Redcliffe 7 days per week during Brisbane’s whale watching season from June to November. Insider’s tip: Bring a light raincoat in case the whale breaches close to your boat! Brisbane Mt Coot-Tha lookout is just seven kilometers from the CBD. If you are looking for things to see in Brisbane the lookout’s panoramic views stretch from Moreton Bay and the airport to the Brisbane River. A cafe and restaurant offering sumptuous meals are onsite. Insider’s tip: Celebrate your great Australian outdoors experience by throwing a shrimp on one of the picnic area’s gas barbecues. Orleigh Park combines fabulous river views with its legendary fire festival. Staged on the night of each full moon, there’s lots of fire twirling and spinning. Hosted by the Firetricks community a group of dedicated circus performers, they create an experience to remember. Insider’s tip: Try your hand at fire spinning under the steady guidance of the performers — it’s seriously cool! 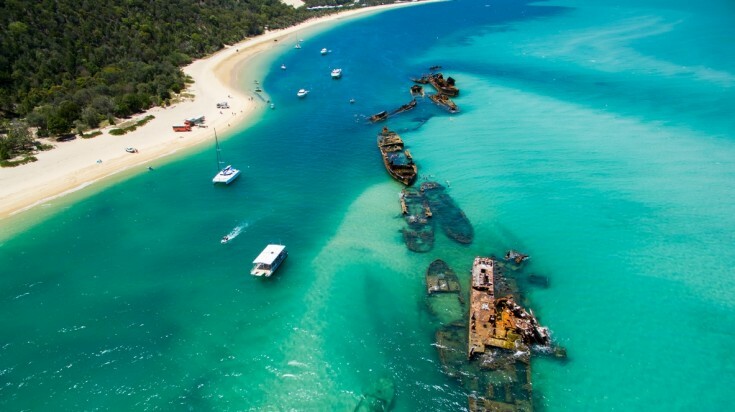 Explore beaches and shipwrecks at Moreton Island. Besides whale-watching, Moreton Island is also a great place to explore flawless beaches, tall sand dunes, and translucent lakes and lagoons. Go bushwalking, try sea kayaking and paddleboarding, cast a line and hook that big fish, dive or enjoy a guided snorkeling tours of the island’s wrecks and reefs. Entrance fees: Entry onto the island is free although transfer and accommodation fees apply. Insider’s tip: Don’t miss hand feeding wild dolphins at the Tangalooma Island Resort! 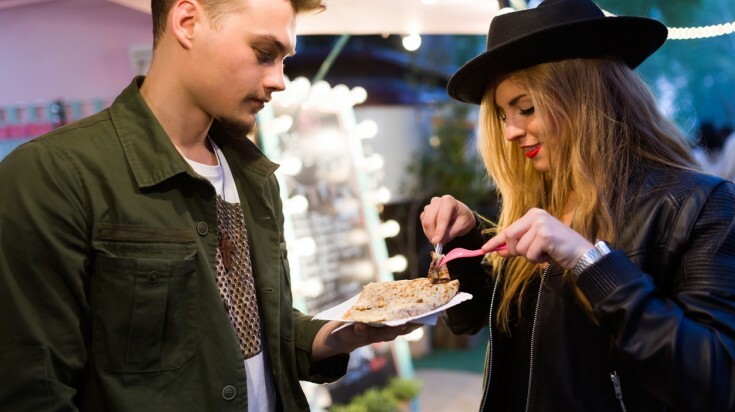 Try varying dishes at the Eat Street Markets. The Eat Street Markets feature exotic culinary delights. The 180 dining and entertainment shipping containers add a splash of color to the river and city views. Encounter Peruvian curries, Jamaican jerk chicken, Vegan, Gluten-Free, Dairy Free and Halal gastronomy. Insider’s tip: Grab a Eumundi ginger beer, a local icon as you explore the nightly entertainment. Located in the heart of Brisbane, this architectural marvel reaches 60 meters in height. This is a great way to get a 360 degree panoramic view of Brisbane City. The 10 to 15-minute ride sees four revolutions accompanied by an audio tour of iconic Brisbane landmarks. Take in the sights of the city during the day or enjoy the beautiful city lights at night. You can even enjoy a Sky High Picnic while indulging in a choice of wines. Entrance fees: USD 10 for children, USD 15* for Adults. Children under three ride for free. Insider’s tip: Plan an evening around the Wheel of Brisbane and enjoy a stroll around South Bank Parklands and visit the Eat Street Markets all in a half day trip. Brisbane is a laid-back city with loads of atmosphere, a dynamic arts scene, sensation dining, and a heaving nightlife. There are so many things to do in Brisbane, whether you’re strolling through its lush gardens, kayaking down the Brisbane River or checking out a live band, you’ll discover a Brisbane that is full of character, awash in welcoming locals and with lots to see and experience.